In Germany, Solid Black German Shepherds are referred to as 'Lacquer Blacks' This is due to the way the light reflects off their beautiful shiny coats! In order for a litter to produce black puppies both the sire and dam must carry the black gene. Solid black German Shepherds only carry the black gene. That means that a litter between two black German Shepherds will only produce solid black puppies. Many people soly breed solid Black German Shepherds with their main focus on the color. They end up with mediocre dogs that are solid black. 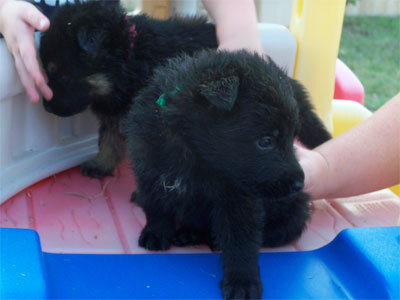 Our litters sometimes produce black german shepherd puppies but we do not intentionally breed for the color. The color comes secondary to the temperaments of the dogs. Some blacks may show tan hairs between the toes or on the pasterns, and some may even show a bit of grey undercoat over the neck and shoulders. Below find a few pictures representative of the Sable German Shepherd Dog.